You can best determine the color (and the properties of the fluid) by taking a sample and placing it on a white piece of paper. Engine oil is usually very black. Transmission fluid will have a reddish hue. Brighter colors and less oily fluids will indicate coolant, washer fluid, or brake fluid leaks. 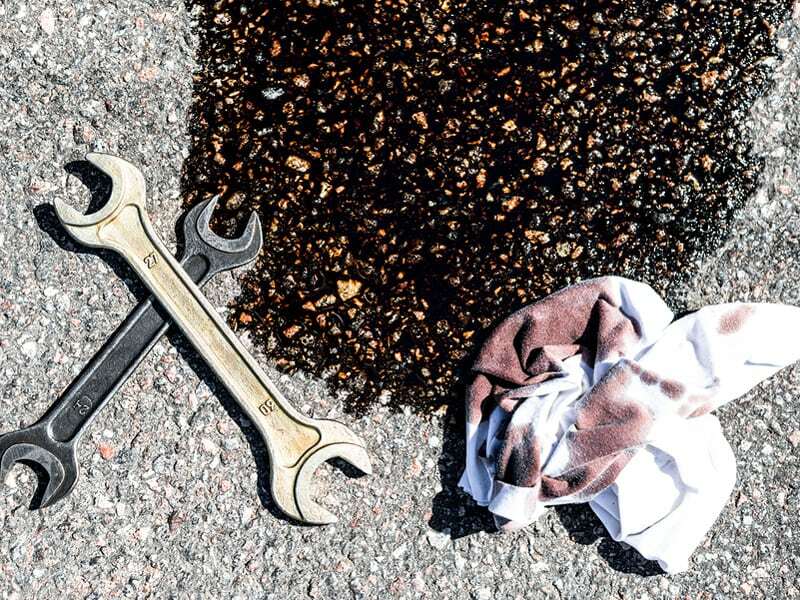 If the color of the fluid is black, this is a sign engine oil is leaking out of your vehicle. Engine oil helps maintain temperature and proper vehicle operation. So, you need to act quickly locate and stop leaks. Engine oil leaks are one of the most common automotive leaks. They usually occur at broken or worn gasket joints around the engine block. Changing gaskets is time-consuming and requires special equipment. 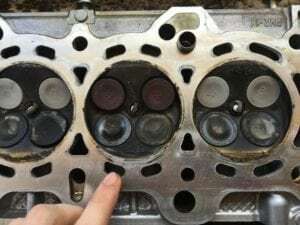 The cost for replacing a deteriorating head gasket is at least $1,000 dollars. To replace the gasket, a mechanic needs to disassemble the top portion of your engine – which can take a few days to replace. Inspecting the area around the engine block’s head. Gaskets are made out of layers of steel and coated with rubber. The cost of a gasket is relatively inexpensive – about $45 dollars in some cases. The cost of the repair, as mentioned above, is a labor-intensive process. Engine oil can also leak from other locations besides the head gasket. Oil can seep past worn crankshaft or camshaft seals. These types of leaks will only be noticeable when the car is in operation. 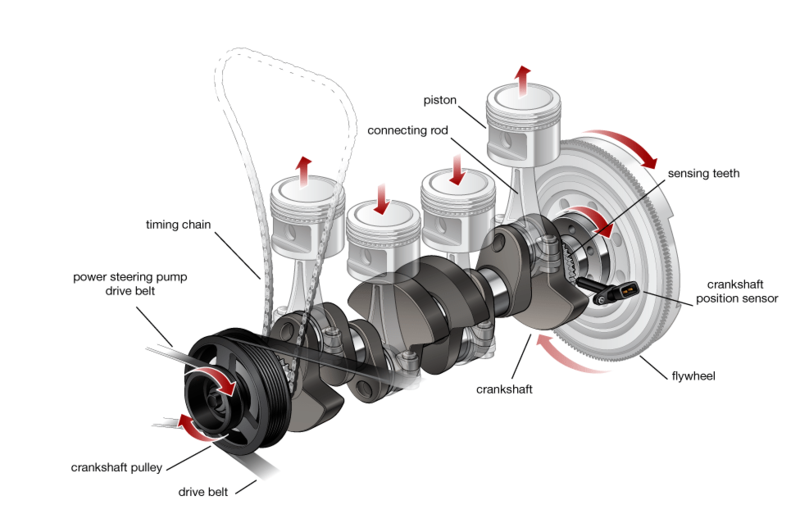 A crankshaft is essential part of your engine. It’s responsible for allowing valve movement – which regulates the ratio of air to fuel. If this ratio is upset, the engine will malfunction and you’ll hear a loud metallic noise as the engine misfires between cycles. This is an indication of the engine’s timing belt slipping, which will throw off the entire operation of the vehicle. If not addressed, the engine will run roughly and loss of power could occur. Overheating, stalling and backfiring, and smoke coming from the exhaust will occur if the leak isn’t fixed. Camshaft repairs can start at $800-1,200 dollars. Like replacing the head gasket, replacing the camshaft seal is a labor-intensive process. Before letting your mechanic go under the hood, you need to guarantee all leak sites are found before the repairs are made. Otherwise, a vehicle will have to return to the shop for additional costly repairs. Leaks can be difficult to find. Leaks can travel from their original location. This can make finding the leak very difficult to find. There are many leak detection methods. But some methods of leak detection are much more obvious and thorough. Tracerline offers ultraviolet fluorescent leak detection dyes to pinpoint the exact location of all leaks. Simply add the fluorescent dye to system, let the vehicle run for a short period of time (to permeate all leak sites), and then scan the system with one of Tracerline’s UV leak detection lamps. Tracerline’s UV dyes are concentrated and safe to use. They won’t affect the vehicle system’s chemical properties. These specialty dyes can remain safely within the fluid system. That means once the repair is made, the dye can be used as part of a preventative maintenance program. 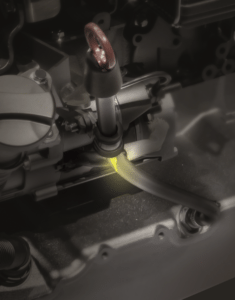 Every time a customer comes back to have their vehicle serviced, all a technician has to do is scan the vehicle’s system with a UV leak detection lamp. 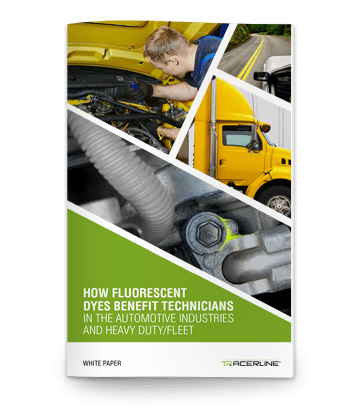 If there are new leaks in the system, the fluorescent dye will glow brightly and indicate the exact location of all new leaks, across fluid-based vehicle systems. UV fluorescent dye indicating leak site. Regardless of how the leak is found and fixed, this one fact is clear: the leak needs to be repaired quickly and effectively. A car owner cannot afford to delay repairs. And a mechanic must find all system leaks without having the customer return to shop. If you want to avoid these situations, use the most trusted name in automotive leak detection. 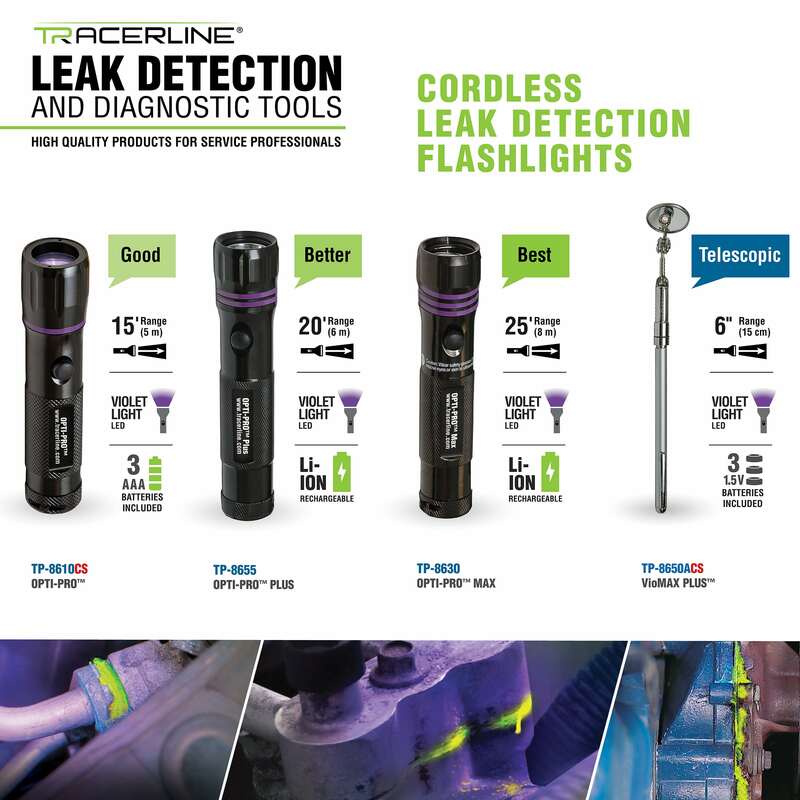 Tracerline has been a leading name in the automotive leak detection market for more than a half-century. 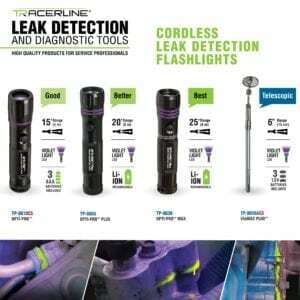 Tracerline developed leak detection and perfected the engineering science behind fluorescent leak detection technology. More than 250 million vehicles worldwide have had Tracerline’s leak detection dyes installed. 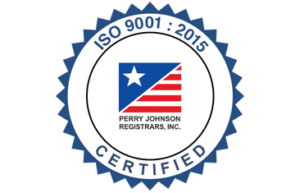 Most importantly, Tracerline’s dyes are OEM-approved and are trusted by industry leaders to deliver the most consistent results. Automotive leaders such as General Motors, Ford, and Mercedes-Benz have used Tracerline leak detection dyes as the leading product in the field today.